Download iOS 9.1 IPSW links for iPhone 7, 6 Plus, iPhone 6s, iPhone 5s, iPhone 5c, 5, iPhone 4s, iPad air 2, iPad Mini, iPad Pro and others. It’s been awhile since iOS 9 was announced and released back at September followed by two other public releases iOS 9.0.1 and 9.0.2 which can already be jailbroken by pangu. Now, Apple has officially released the final version of iOS 9.1 supported for most models of iPhone, iPad, iPad mini and iPod touch globally. The official iOS 9.1 IPSW download links (according to devices’ models) are listed below. 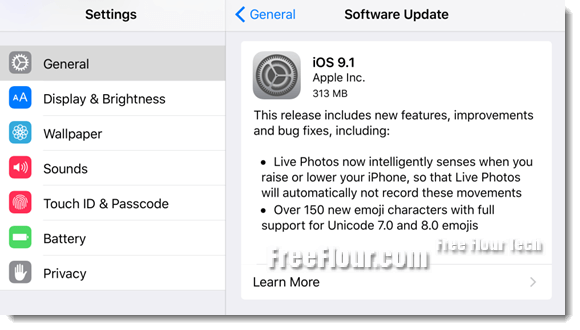 Like all the previous releases, iOS 9.1 comes with mainly bugs and issues fixes, exclusive new features, and improvements on existing features introduced in iOS 9. Well, it doesn’t seem like an important update that has any significant change. If you don’t rely on a jailbreak, you may just update to iOS 9.1 for good. iOS 9.1 is currently available for iPhone 4S, iPhone 5, iPhone 5C, iPhone 5S, iPhone 6, iPhone 6 Plus, iPhone 6S, iPhone 6S Plus, iPod Touch (5th generation), iPod Touch (6th generation), iPad 2, iPad (3rd generation), iPad (4th generation), iPad Air, iPad Air 2, iPad Mini (1st generation), iPad Mini 2, iPad Mini 3, and iPad Mini 4. If your device is not listed in the list, there wouldn’t be an iOS 9.1 update in your Over-The-Air update page (which can be accessed via Settings, General, Software Update). If you forcefully use a random iOS 9.1 IPSW download link listed below, it wouldn’t work either. The most significant changes is the introducing of the 150 new emoji characters you can use for your messaging and texting apps. It’s not an entire new set of emojis but additions to the existing categories, such as new animals in the animal emoji category, new faces and emotions, new foods, and most importantly a new middle-finger emoji (finally). There is also an update for the Live Photos, a new feature previously introduced in iOS 9.0 which now sense the movement of your iPhone, specifically when your raise or lower your iPhone, to prevent it from automatically record these movement which usually are unnecessary. Updating via the Over-The-Air software update directly from your device is always the much preferable way. But if for some reasons you need a clean install using the IPSW installation files, listed below are all the iOS 9.1 IPSW download links provided by Apple officially (available only for devices listed accordingly) you can use to restore from your iTunes. Links removed due to expired iOS version. The most commonly asked question is, will this update delete all my stuffs when I proceed to update? Well, it depends. If you update it directly from your device using the Over-the-air update (setting, general, software update), it won’t delete any of your details, files, photos or anything else. You will get to update to iOS 9.1 with all your previous apps and files intact. However, if you are to update by restoring on iTunes, you will have to Backup your iPhone or iPad before you proceed so that you can restore your backup files after the update. If you rely on a jailbreak for your device, don’t update to iOS 9.1 just yet because there isn’t any jailbreak tool that can fully jailbreak iOS 9.1 now. Well, if you have accidentally updated to iOS 9.1 only to know that it isn’t jailbroken yet, we would advise you to immediately downgrade to iOS 9.0.2 now before Apple stop signing iOS 9.0.2. Edit: Apple has stopped signing for iOS 9.0.2. Downgrading now isn’t possible anymore. Do not update to iOS 9.1 before jailbreak is available for iOS 9.1. We will keep you updated and informed as soon as iOS 9.1 is available for jailbreak in this weblog. You may want to like us on Facebook to follow the latest updates on iOS and jailbreak releases. Simply click on the like button beside my name below to follow us.